This children’s book caught my eye in the library, as it was shelved under the author’s name, which I recognized immediately from her other books. Then I was attracted by the opening line (above), especially because my daughter-in-law is a professor who studied Leonardo. With two positive things going for it, I plunged into reading and didn’t stop until the end. What I discovered was that this is quite a lovely way to introduce older children to the world of Leonardo da Vinci, and his painting of the Mona Lisa. I would say this is a must for any home school or Waldorf school class that is studying the Renaissance. It makes so much come alive in one simple children’s book. The writing and concepts in the book are not necessarily simple, so I wouldn’t expect younger readers to get much out of it. But as a work of historical fiction, I think it does a terrific job. I have one minor complaint: occasionally the characters lapse into speech and word usage that would definitely not have been accurate for that time period. They leap out at you as anachronisms. However, that could add to an interesting classroom discussion about the use of language and being true to a historical period. All in all, I think this children’s book has a lot going for it. 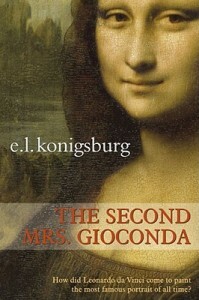 However, I will modify this review, once I hear from Jill, my family authority on Leonardo, including the question of spelling: the hardback version says “Giaconda” and the paperback version says “Gioconda.” Which is it, Jill?